Every session is a challenge as a new clinician. I remember the crazy amount of time I spent preparing for each treatment session in graduate school. Luckily, as I gained knowledge and experience, I became more efficient and comfortable. I learned the right questions to ask and where to start with a student, and also how to listen, watch, and respond appropriately as the session and therapy progress. Every once in a while, though, I find myself in a therapy situation that feels really different from my comfort zone. It doesn’t mean that I’m not prepared to manage it, but I know I’ll have to put in some time to figure out the right questions to ask. And I know I’ll have to over-prepare to be ready to respond with my therapy! This was certainly the case when I started using a telepractice model. Ten years later, I’ve gained knowledge and experience that make me a much better clinician, on video or not! And still, cases arise that make me sit up straight and put my thinking cap on. You know the ones I’m talking about — “How are you going to serve this student over telepractice? !” “We’ve never done it this way…” “I don’t know if this is going to work…” When telepractice is the only option for a student to receive services, due to geography, economics, timing, or some other factor, we can find ourselves faced with the need for some serious creative-problem solving. 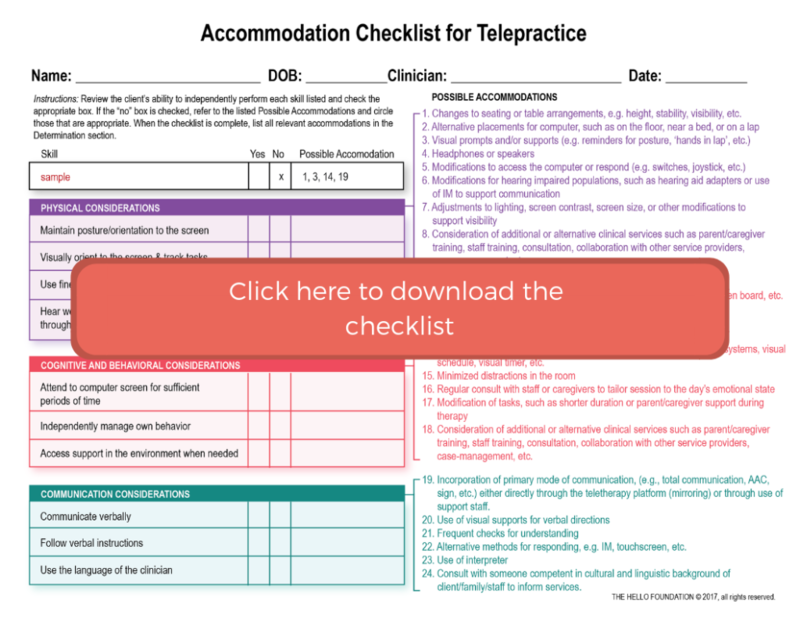 My favorite tool to guide teams through these tough conversations is our Accommodations Checklist for Telepractice. We designed the form so that teams would be able to look at Physical, Cognitive, Behavioral, and Communication considerations, and then decide what sort of accommodations need to be made to remove the barriers to accessing services via telepractice. It also has a section to guide the discussion about what sort of Support Resources the student might need, as well as an area to delegate roles and responsibilities and to make a determination of appropriateness. Yup, I'm all about it. Cool! Who do you primarily work with? I love it because it takes the focus off the model. It turns the conversation toward the student’s skills and needs, and the capabilities of all the people on the team. By looking at the time, space, knowledge, and supports that are available, an IEP team can decide how to spend them in a way that is sustainable and agreeable to the whole team. It’s been used by teams serving just about every type of student you can think of — preschoolers, AAC users, students with limited vision or mobility, students with challenging behaviors — and on teams that are facing their own internal challenges as well. Give it a try with your easiest and your toughest cases, and let us know what you think!